In the heat of a desert country, an American businessman is desperately trying to succeed in a new venture, or risk going home empty handed. Set in the Saudi Arabian desert, the novel explores the theme of the need to succeed. Press photo. Dave Eggers sketches a portrait of a character struggling with the economic effects of globalization and the emotional roller coaster of a mid-life crisis in his novel, A Hologram for the King. Alan Clay is lost, his confidence is shaken and he is slightly paranoid. He has to pitch an IT project to Saudi Arabia’s King Abdullah or he will be unable to pay off his debts and his daughter’s tuition. Clay is hired by an IT company, called Reliant, to pitch its services to the King, in an attempt to provide technology to the new developing “King Abdullah Economic City.” Clay arrives in Jeddah to find that his team was designated a tent to prepare for their pitch and are seemingly isolated from the other business employees. The air is hot and the people around him don’t seem to fit the images in his guidebook. He expects the natives to be conservative and reserved, however he finds a few that are liberal and go against cultural norms. He tries to prove himself to the three young people working with him by pushing for better air conditioning and Wi-Fi reception. Meanwhile they shuffle back and forth between the tent and the hotel, lazily waiting for the King to arrive. The plot centers around the time spent on the preparation of the hologram, where he befriends his driver, his colleagues and his doctor. We learn through short, thoughtful prose the emotional difficulties of Clay’s failed career and failed marriage. Clay is divorced from his wife Ruby and feels close to his daughter Kit. However, he only communicates with Kit in the form of email drafts he never sends. Clay had tried to start his own bike manufacturing business in the United States, but was unsuccessful because most production projects were overseas. Reliant is a possible remedy to that failure. A Hologram for the King delves into Clay’s head with short, rich details. He floats back and forth between his memories and his observations of Jeddah. Clay doesn’t plan on staying in Saudi Arabia forever, yet he feels a pull to it. The complexity of wanting to succeed, to prove that you are worthy is an echoing sentiment in this story. When he has a cyst removed from his neck in Jeddah, Clay is sorry it is not cancerous. At least then, he would not have had to worry about paying Kit’s tuition fees. The writing style is simple, yet aims to be provocative throughout most of the novel. “They were married in a breathless hurry,” writes Eggers on Clay’s former marriage, “but Alan felt early on that she was looking through him. Who was he? He sold bicycles. They were mismatched. He was limited. He tried to rise to her level, to broaden his mind and see things as she did, but he was working with crude tools.” Eggers writes in short sentences, sometimes repeating his pronouns to highlight emotions. Life is a complex web of people, who carry their past and their present with them. 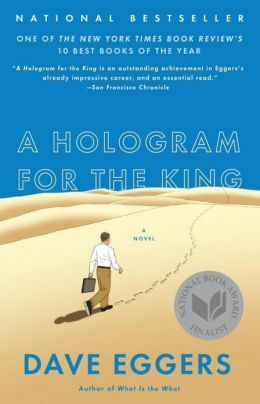 A Hologram for the King takes us on a journey, wandering in a middle eastern country, trying to find a way to mold the flawed past into a new beginning, or to simply survive.